"I can't stay. I dropped in to have a drink between parties." The spiffy, over-the-top Brit television spy series The Avengers was a marvelously oddball program during the 1960s, and served to introduce a young me to one of my first TV crushes: Emma Peel (Diana Rigg). Of course John Steed (Patrick Macnee) was a suave, dapper secret agent, with his bowler and umbrella, but it was his partner that really caught my eye. Emma had much the same effect on me that Julie Newmar's Catwoman from the Batman series did, though for vastly different reasons. While Catwoman was so very baaaaaaad, Emma Peel was oh so good. She could fight. She had the accent. When the Emma Peel character was replaced in 1968 by Tara King (Linda Thorsen) I was expectedly anxious. While I may not have taken to Tara King as readily as I did to Emma Peel at the time, through this new A&E collection of her episodes I have the opportunity to look at things a bit more rationally. By the 1968 season, the series still had more bizarre originality than most programs of the era, which is even more evident watching this DVD collection over thirty years later. Strange villains, weird assassins, you name it. Not only that, but the whole "Emma" vs "Tara" battle that raged in my young mind seems inconsequential now, as I realize that Linda Thorsen's character was every bit as unique and entertaining as Diana Rigg's. It's just that Thorsen had the unpleasant task of replacing one of the more memorable female characters in television. Tara King: "A colonel in a lighthouse?" This is no doubt one of the more exciting episodes from the 1968 season. In a strange, almost X-File-ish plot at times, Tara is sent to the mysterious Carmadoc Research Establishment to investigate a "leakage of secrets," as well as a suspicious death or two. Steed is ordered by Mother (if you have to ask, well you just don't know) to stay behind and "rest" amid a bevy of scantily clad beauties. Working Steed-less, Tara is partnered with the rather bumbling Watney (Dinsdale Landen) as they work to uncover the mystery and secrets that lurk amid the research facility. An apparently invisible killer is "seen" killing off a few characters, and it's up to Tara and Watney to unearth the truth. The Leigh Vance script is paced nicely, with a strong amount of trademark humor and unusual plot developments to keep the storyline from becoming too predictable, which in The Avengers universe is quite hard to do. Thorsen's Tara is an absolute charm in this episode, and I believe that All Done With Mirrors stands as her finest moment on the series. John Steed: "I got it tonight. A bequest from an unknown benefactor." The Legacy Of Death episode is a good example of the quirky humor quotient that made The Avengers such ideal escapism. The ornate Falcon Dagger, also known as The Dagger Of A 1,000 Deaths, is bequeathed to John Steed from a mysterious stranger. Unbeknownst to Steed, a small army of assorted treasure seekers and assassins are also seeking the dagger, and it's not long before the dead bodies start piling up. Amidst plenty of champagne, Steed and King eventually come to learn the real meaning of the dagger, and it's ultimate purpose. The highpoint of this episode for me are the colorful, almost comic book like team of assasins that plague Steed every step of the way. Some these include a pair of Sidney Greenstreet clones, a man in a wheelchair pushed by a midget, and a killer that only uses a "cherry picker" truck. An especially subtle comic sequence appears when Steed visits the law office of Dickens, Dickens, Dickens, Dickens and Dickens, and tries to speak with Mr. Dickens. Raiders Of The Lost Ark fans might be interested in the fact that Ronald Lacey, who played the evil Nazi Toht, appears in this episode as the sniveling killer Humboldt. Tara King: "Who were you chasing?" John Steed: "A suspected sabateur." Tara King: "A ruthless type?" John Steed: "Utterly. Trampled right across a bed of Queen Mary Roses." In this episode, John Steed is recuperating from a broken leg at a "secret nursing home" deep in the English countryside. The facility is so secure that it is surrounded by a minefield and electric fences. The opening sequence sets up the premise that Steed is to be killed at noon by a pair of nefarious assassins, for reasons unknown. As the story unfolds, it is revealed that the man hunting Steed is a former adversary, the infamous Kafka. It's not long before Tara joins her partner at the secret facility, and the pair find themselves battling for their lives as the villains arrive and slowly kill off the other agents one by one. Noon Doomsday has more than a few parallels to the classic western format, as there are many stylized shots that seem to either parody or pay homage to that genre. It is of particular interest to note the Sergio Leone influence during the scenes where the two killers are waiting for Kafka. Image Transfer Review: For a series as long in the tooth as The Avengers, these 1968 episodes still look particularly good. Presented in a decent 1.33:1 full-frame transfer, most of the color field comes across in that perfectly gaudy late-60s' palette. With the exception of some extremely faded colors on the opening title sequences, A&E has managed to imbue these discs with a healthy dose of the series original flashy style, which was missing on the earlier black & white episodes. Some of the flesh tones play a bit flat here and there, but overall the presentation is pleasantly consistent. Tara King's trendy outfits look especially vibrant throughout the two disc set. There are only a few random moments where the image quality dips Some everpresent nicks pop up from time to time, but not to the point of distraction. Audio Transfer Review: A&E presents The Avengers with a perfectly adequate mono track that does not suffer any serious limitations. Dialogue is never muddied, and always understandable. Laurie Johnson's shagadelic score comes across terrific, too. Extras Review: Sadly, A&E has only provided 6 production stills (two per episode) as the supplementals. The images themselves are quite small, and really serve no purpose. Each episode has 8 to 9 chapter stops, which is more than adequate for a 50-minute program. 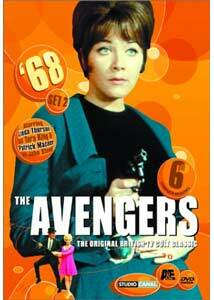 The Avengers television series was one of the more inventive and clever of the 1960s. A&E's release of the Tara King episodes, spread across two discs, is a splendid sampling of that era.